Our 35mm Prestige artificial grass turf is easily one of the most popular picks from our stock, especially among homeowners and families with pets looking to make their garden as soft and luxurious as possible. 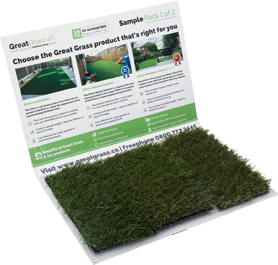 It features a host of incredible features such as a tri-coloured palette of lush green colours ensuring that this lawn is virtually indistinguishable from the real thing, and all of the technology that makes our grass so great. A free draining, water resistant latex backing ensures that you won’t be dealing with weeds or mud, as water drains away past the base layer of the grass in no time at all. It’s heavy duty artificial grass, guaranteed to last, but it’s not rough or hard to the touch by any means. You might wonder how we’ve achieved that, and we wouldn’t blame you! Even the infamously taxing weather that the British winter brings is no match for the fantastic top quality of our artificial grass, and it’s all down to the uniquely innovative technology that we bring to the table. We’re talking about Clever Yarn of course, our revolutionary W-shaped pattern in which every strand of artificial grass is firmly yet flexibly stitched into its latex backing. It’s thanks to Clever Yarn that our 35mm Prestige artificial grass and many more products can so easily resist flattening and damage without compromising a thing in the way of aesthetics, so don’t wait to see how it could transform your garden today! So, next time you find yourself on the lookout for some of the highest quality commercial artificial grass on the market, make sure you don’t miss out on what our 35mm Prestige artificial grass could offer courtesy of our innovative Clever Yarn technology. With an outstanding dedication to customer service, our team is always waiting to hear from you and deliver the perfect artificial grass, so make sure you don’t wait to get in contact.